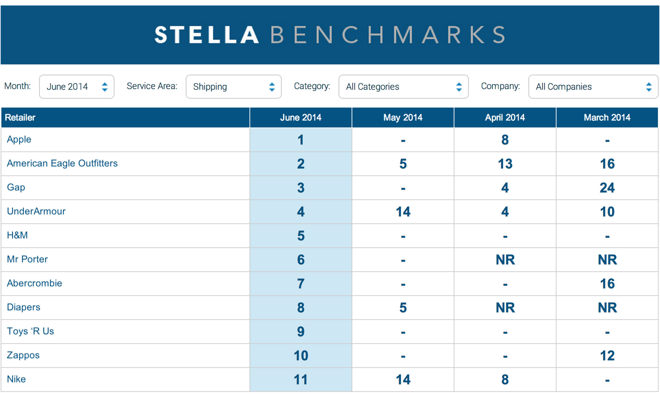 According to fresh data from customer service analytics company StellaService, Apple ranked No. 1 on the firm's charts for the first time ever in June, averaging 2.3 days to process and deliver online orders. In a study published on Wednesday, StellaService found the Online Apple Store to have highest performing shipping metrics of top online retailers in June, including Amazon, Zappos and Nike.com, among others. This was the first time Apple took the top spot in the firm's shipping category. Alongside Apple in the top five were four clothing outlets, American Eagle Outfitters, Gap, UnderArmour and H&M. Overall, the average ship time of all top 25 retailers was 3.1 days, though other metrics are rolled in to the final assessment, like delivery date estimate, package fit, package quality and more. In addition, Apple was the only tech company to make it into the list's top 25 for the shipping category. In terms of phone and Apple's customer service, measured by email, phone and chat, fell during the past three months. In May, for example, the company's phone-based service was ranked at No. 6, but fell below the top 25 in June. Chat response was previously second place on StellaService's list in March, but dipped to 24th place in April and below 25th place last month. Despite its relative shortcomings, the Online Apple Store scored high marks in overall performance, taking third in June place behind J. Crew and Mr Porter. Ralph Lauren and L.L. Bean, which was ranked No. 1 in May, rounded out the top 5. Apple's online storefront previously reached a high of 7th place in April after coming in at No. 15 in March. To generate its metrics, StellaService deploys e-commerce analysts to engage with and quantify the speed and quality of online retailers in terms of order fulfillment, customer service and returns and refunds.